STOP PRESS: please check out and support this effort by locals to get another Disc Golf Course in Nelson. Branford Park is in the picturesque Maitai Valley and has enormous potential for an excellent low-impact recreational pursuit for locals and visitors alike. Jump to their Facebook page for more information - click here. A beautiful location for a nice short, tight, technical course. Isel Park, in the Nelson suburb of Stoke, is the place to be! As the park is quite tight, and is used by many of the unconverted (non-disc golfers), please do your utmost to give them mucho respect. If there is anyone even remotely in the area of your play then please wait for them to move on. If they are camped out for a picnic then please skip that hole and come back to it later. General park users ALWAYS have the right of way. Tees: Most of the tees are a line of brick tiles with a couple being the edge of gravel paths. Hole #1 Par 3 Distance 51m. A tile tee, just 5 meters from the main sign. Aiming straight over the stream to the basket just in front of the fence. Watch out for the stream, the path just over it and the path just past the basket. Land on any of those and you incur a 1 shot penalty. Hole #2 Par 3 Distance 64m. Tile tee situated back towards the stream. Either choose the line to the right of the tree in front of you with a lovely right-hander’s fade to the left, or take your chances with the shorter route through the trees – an unlucky mack of one could land you in the stream though. Hole #3 Par 3 Distance 76m. A tile tee, just back a few meters from the 2nd basket. Standing on the tee, look straight down through the obvious channel till you get to the tall poplar tree will the upward pointing branches. The base of this tree is hollow with 3 holes in to it. Land your disc inside to finish the hole. The disc must be 50% or more inside, and cannot bounce or roll back out. Hole #4 Par 3 Distance 56m. Back across the path by the seat is the 4th tee, tiles again. Looking in the direction of the main road, through the obvious (but small) channel, you’ll see a pole. You just need to hit the pole the complete the hole. Hole #5 Par 3 Distance 76m. A tile tee, back up towards the poplar tree. The obvious channel down to the basket with the Countdown backdrop. Watch out for the disc eating tree just over the other side of the stream.For right handers with big enough arms, make sure there’s no one sitting on the bench past the last trees on the left. Hole #6 Par 3 Distance 94m. A tile tee just before the seat. Another pole hole. A compulsory line of going through the ‘goal’ formed by the two trees in front of the tee, following along the obvious channel then sweeping back to the right and into the pole. The tee is on the left side as you are facing the previous target pole. The hole plays downstream with a fade to the right. The target is the same target as used for hole # 4. Hole #8 Par 3 Distance 71m. Tile tee just besides the hollow poplar tree. The target is the basket used on the 2nd hole. Hole #9 Par 3 Distance 54m. Tile tee just next to the 1st basket. Playing back over the stream and aiming for the pole. A short hole with a chance of a nice refreshing paddle, if you’re not quite on target. Hole #10 Par 3 Distance 62m. The tee is the triangle where the garden border, main path and woodchips meet. Aiming up into the park with a big bend to the left into the basket situated in a small group of tall pines. Watch out for the invisible branch that jumps out and grabs your disc just when you think it’s on the perfect line! Hole #11 Par 3 Distance 53m. A tile tee just back a few meters from the last basket. Aiming for the basket in the garden border up from the picnic table. There’s a compulsory of going around the right of the tree to the right of the table. Do not play this hole of anyone is sitting at the table. Hole #12 Par 3 Distance 49m. A tile tee. A short hole. A big tree and a small niche. Aiming for the huge tree on the leftwards lean. If the base of the tree is a clock, with 6pm being the side facing you and 12pm being the side opposite, at about 4pm there is a small niche just big enough for a disc. Land your disc in there to complete the hole. Do not play this hole if there is anyone sitting on the bench just behind the tree. Hole #13 Par 3 Distance 55m. The tee is in line with basket just over the path. Aim down the gravel path and once you have passed the 8th tree hang a left and you’ll see the basket a few meters in. If you go through any of the pairs of trees before the 8th though, your next shot has to go back through those same two trees before you can advance down the path, around the 8th tree, and into the basket. Hole #14 Par 3 Distance 64m. A tile tee just besides the tiny tree out in the open area. Aim around and over the blossom trees to the basket at the high point of the garden border. Hole #15 Par 3 Distance 72m. The tee is the edge of the gravel path down to the left (as you are facing it) of the 15th basket. Aim out across the open area to the obvious basket. Hole #16 Par 3 Distance 68m. The tee is in the small gravel area.. 2 compulsories on this hole: firstly, staying to the obvious right of the tree that had compulsories on the two earlier holes. Secondly, you have to travel through the ‘goal’ formed by the monkey puzzle tree and the tall tree to it’s right. The basket is just through the goal and to the right. Hole #17 Par 3 Distance 56m. Almost a reverse of the 11th hole. The tee is the edge of the gravel path a few meters to the right of the 11th basket. The target is the basket used already by the 10th hole with a compulsory around the same tree as the 11th, this time obviously, you need to stay to the left hand side of it. Once again, do not play if anyone is using the table. Watch out also for anyone walking down the main path/road, right-handers especially. Hole # 18 Par 3 Distance 68m. The tee is on the woodchips at the base and to the right of the tall heritage pine tree with vertical stripes/gashes in it. Aim for the bin down the road and to the left. Check the path before throwing for any other park users. 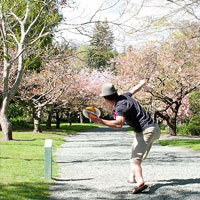 Click locations on the map of New Zealand for information on disc golf in that area. Here's the direct link to this map in Google Maps.